I mentioned in my last post that I don't appear to have the stamina to cross over the Santa Cruz Mountains and then cross back. So before I tell you about my trip over Eureka Canyon Road, I need to go back to a truncated ride in May that led up to it. This is bound to be a long post. In early April I thought about riding up Eureka Canyon Road, and did a little research. 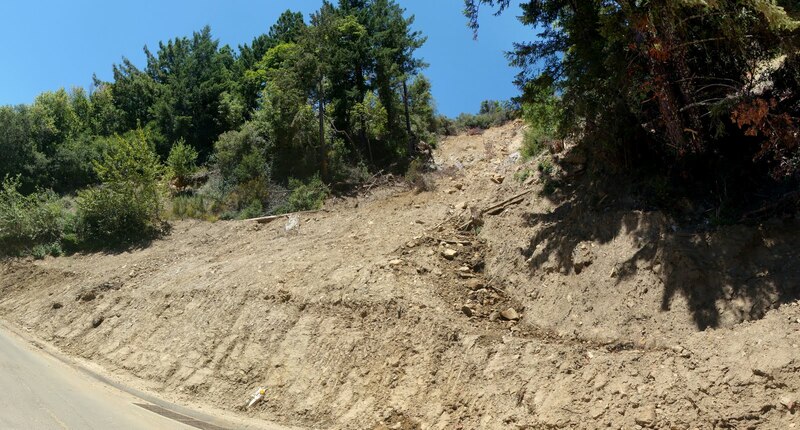 As it turns out, there had just recently been a mudslide that closed Highland, which is the natural road between Eureka Canyon and my house. Apparently this happens quite a lot. This was initially bad news, but within a week or two the mud had hardened to the point that one could walk across it. Seeing this little example of nature's fury seemed interesting, so I set off. I wanted to come up Eureka Canyon Road, and there's no easy way to do that without going down to the Capitola area first. So the plan was to ride to Summit, then down Soquel/San Jose Road to Capitola, then around to Corralitos and the return trip. Instead of turning on Soquel/San Jose I could have just continued on Highland, but I wanted to see Eureka Canyon and I hadn't yet come to grips with the shallow depths of my endurance. As I look at the Garmin data now, I see that I started off on Saturday, May 7 around noon (and therein lies part of the problem, but more on that later). 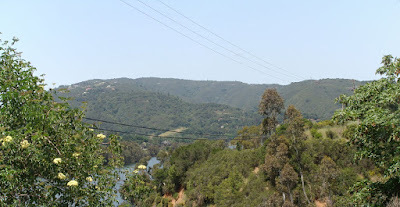 As usual, I headed over to Los Gatos, down the Los Gatos Creek Trail, and around the Lexington Reservoir on Alma Bridge Road. From there I climbed Old Santa Cruz Highway up to the ridge, and turned left on Summit. Just past the store I turned right on the Soquel/San Jose Road, and dropped into Capitola. So far so good. At this point I would gladly have taken the easiest, shortest possible route to Corralitos, but the only decent route I could see on the map took me right down to the bay, which I'll remind you is located at approximately zilch elevation. I went up Park Avenue and took a right on Soquel Drive. 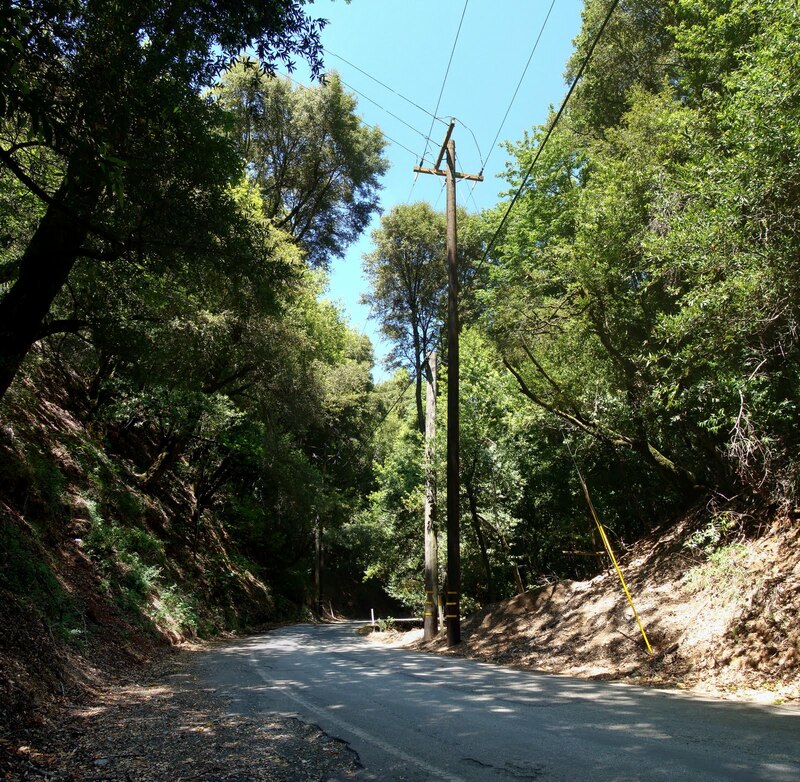 Soquel Drive roughly parallels Route 1, and transforms from generic suburbia to wooded rural. 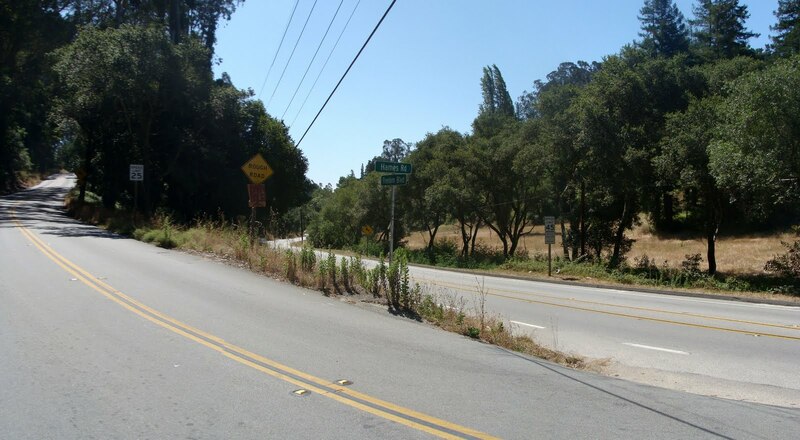 Soquel Drive meets up with Freedom Boulevard, which sounds like a monstrous suburban road but actually turns into a rural two-lane road as it heads northeast. Eventually Hames Road peels off (and up) to the left. Hames Road rising to the left; Freedom Boulevard to the right. On the map Hames Road didn't seem like much, but it starts off with a steep ramp, and then there's another shortly afterward. The reward for this little climb is the Corralitos Market and Sausage Company. By now it was midafternoon, and I had a late lunch. The Corralitos Market. Great sausage. The Corralitos store marks the base of the Eureka Canyon climb. I started up the climb, but I was drained. I was making very slow progress, resting after any measly effort, and if I kept slowing down it would be quite dark before I finished. So I rolled back down to the store and called my lovely wife for a rescue. That brings us to last Sunday, when my wife participated in the Wharf to Wharf run. I drove her down to the start in Santa Cruz, then parked near the finish in Capitola. But I brought my bike so I could finish off this ride as she drove home. By the time the race ended and we returned to the car it was about 10:30. The morning's clouds had disappeared, but it remained cool. I retraced my path up Park to Soquel Drive, then Freedom, Hames and the store. I even retraced my steps in the store by having a sausage sandwich (Turkey Andouille, for the record) as an early lunch. Initially Eureka Canyon Road winds through some orchards and other light agriculture, but within a mile becomes a mostly shaded path through thick Redwood-heavy woods. It follows Corralitos Creek very gently upwards into a narrow canyon (that plays havoc with the GPS altimeter, I can report). The road serves a few houses and a couple of camps, but as far as I can tell has very little traffic. Once upon a time I was part of that traffic. When I first moved to this area a few years ago, I drove up this road. I took a little sightseeing drive down 152 toward Watsonville, and then looking for an obscure route back I saw this road on the map. I didn't know then that it was so tiny or prone to closure. But while I remember driving through the woods and seeing the grand view across the valley, I missed everything important. I didn't hear the water flowing or feel the shade. I didn't realize that the four corners area was at the top of the hill, because of course elevation changes meant nothing to me in a car. I got no sense of isolation, of being practically (if not actually) alone in these hills. Cycling gives you a real sense of site and situation. 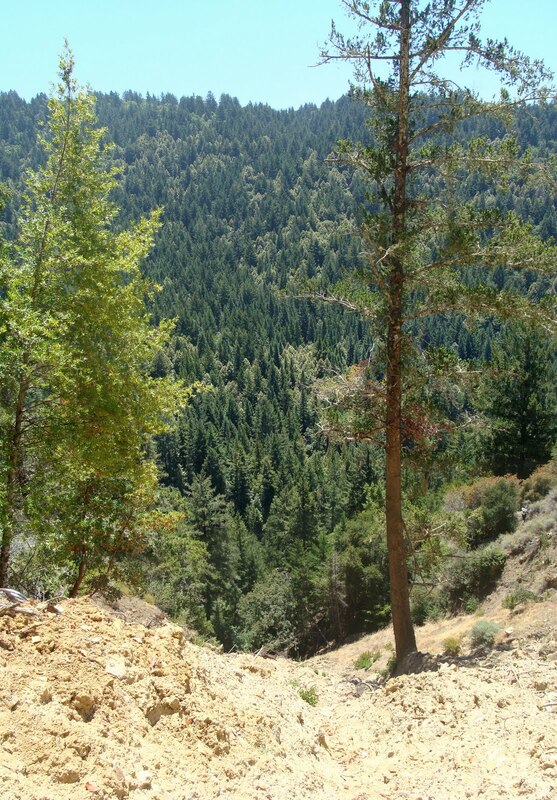 Within a few miles you get to an intersection with a dirt trail called Grizzly Flat Road, and the road turns toward the west. Around this point it starts climbing a little more steeply, clinging to the southern flank of the ridge. It climbs out of the trees and begins offering views of the valley. Eventually the road climbs up to the junction with Buzzard Lagoon Road and Ormsby Trail (aren't the road names great up here? 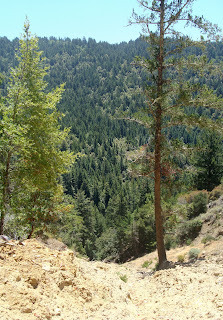 ), and Eureka Canyon becomes Highland Road. The repaired section of Highland Road. The four-way junction is a local high point at about 1950 feet. From there, Highland descends perhaps 200 feet and crosses an entrance to the Soquel Demonstration Forest, popular with mountain bikers. In fact, I'd bet that pickup trucks carrying mountain bikes account for half the traffic up here. Before you know it you climb back up to 1900 feet or so, and finally reach the area of the Great Mudslide of 2011 (not to be confused with those of 2009, 2007, or the 1990s inclusive). When I first saw the photographs of the damaged area in April I was sure that Highland would be closed for years, if not forever. I must say that I'm impressed that the impoverished county government was able to do so much work so quickly. The road is clear and looks to be in pretty good shape, although it appears that they haven't started to address the hill yet. Highland continues on, mostly flat, passing by Mount Bache Road before quickly dropping 300 feet to meet Summit Road very near the Summit Store. I stopped for drinks. From Summit Road it's the old familiar way home, down Old Santa Cruz Highway. This time I passed by Aldercroft Heights and the ride around the east side of Lexington Reservoir. Instead I stayed on Old Santa Cruz, passed briefly onto New Santa Cruz Highway (sometimes called Highway 17) and then up the Los Gatos Creek Trail and finally back to Almaden. The Garmin reported the first ride in May as 50 miles with over 4000 feet of climbing. It reported the second ride as 45 miles, and again over 4000 feet of climbing. In both cases, that's far too much climbing -- I don't see how it could be more than 3000 on either day. It also reported insane calorie consumption. Even with the revised numbers, it's clear that I need some better shape before I'll be able to put both of these rides together on the same day. One thing I've never managed to do on my bike is ride over the Santa Cruz mountains... and then back again. I'm not quite sure why. I am by no means an accomplished cyclist, but I've survived rides with more total elevation gain -- Mount Hamilton, for example. I suspect it has something to do with the total length of the ride, or else the fact that the climb back over the hill inevitably takes place after a long rest or a meal. So it was that I made my most recent attempt yesterday, with the same result. I took a by-now-familiar route to the ridge of the mountains. For me, that means first over to Los Gatos and then up the Los Gatos Creek trail. You have to climb up a very steep, loose dirt ramp near the end, which isn't easy on skinny tires. Then it's up the face of the dam, and around Lexington Reservoir on Alma Bridge Road. The very pretty Old Santa Cruz Highway takes you to Summit. I've ridden that route many times, but at the intersection with Summit I've always turned left, toward the Summit Store and Loma Prieta. This time I went the other way. Since Summit/Skyline always goes up, it went up. In this case there's a short ramp that lifts you from 1600 feet at the intersection to about 1800 feet, at about a 10% grade. Ugh. After another ramp, not quite as steep, you drop down quite a bit and cross I-17. But then you have to immediately climb up the other side to meet the top of Mountain Charlie Road. Ugh, again. A little more climbing brought me to what turned out to be the peak of the ride, along Summit Road. At this stage, with the road roughly level, you could really enjoy the beautiful day and the scenery. Summit Road here is a one-lane country road, with a Christmas tree farm, vineyards, puffy clouds and layered views. Here I was riding in the middle of summer, and when I started out I was wondering whether to bring a jacket. Not too bad at all. 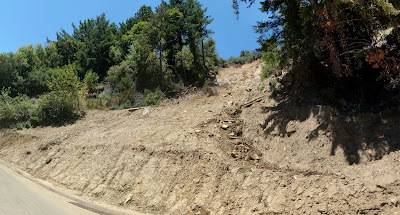 The road falls quite a bit to the intersection with Upper Zayante Road, my target for the day. I'm going to have to remember that if I come back up this way. I went down Upper Zayante, which is a lovely, windy, one-lane path through some deep woods. The top part of the descent is fairly steep and twisty, and I stopped several times to let my rims cool. I suppose that means that coming back up this way is difficult, but that's a concern for another day. Upper Zayante Road drops down the ridge until it meets Zayante Creek, which it follows all the way down into Felton. Along the way it actually gains some altitude, and lower down the road it rolls a bit, as one would expect. I finally rolled into Felton about 2 in the afternoon. 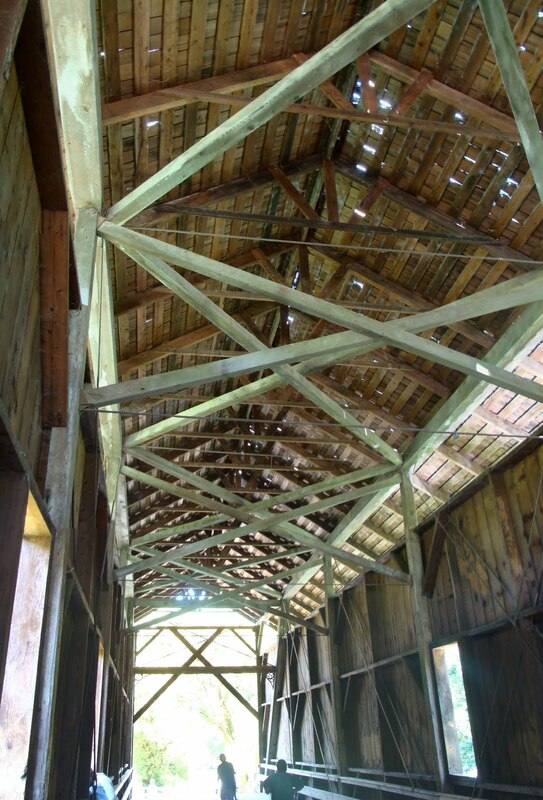 I stopped by a grocery store for a sandwich and some drinks, then went over to the part next to the covered bridge to eat. 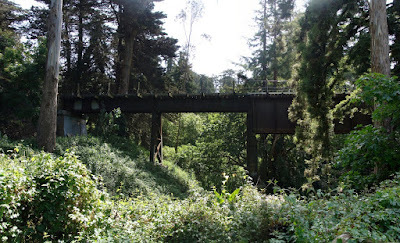 I've been to Felton a few times, mostly for the Big Trees Park, but I had never seen the bridge before. I guess my expectations were pretty low, but I must say it's an impressive bridge. It's much larger than I expected, and much taller than any other covered bridges I've seen. Well, now, it's time to go back. My plan, at this stage, was to ride back to Summit on Mountain Charlie Road. I finished my sandwich and hopped back on the bike, but then as soon as the road tilted upward I knew I was toast. There was no way I was going to make it back up there. I slunk back to the park and awaited a rescue from my wife. The Garmin registered about 30 miles and 3100 feet of climbing, which is probably a little generous. It also reported an insane number of calories consumed, which I don't really understand. But maybe it knows something I don't; maybe that's why I didn't have the energy to back up to the ridge. Who knows. In any case, it was a lovely afternoon. Yesterday was perhaps the hottest day of the year so far here. The wise choice would have been to hunker down, close the windows, and fire up the air conditioning for the first time this year. Instead, I chose to head out for a long bike ride. OK, then, in that case the key would be to get an early start. So it was that about noon I rolled out on my ride. There wasn't a merciful cloud in the sky, and it was already about 90 F, which is about... let's see here... 12e Celsius, I guess. My plan was to start in Saratoga, ride up Montebello Road to Page Mill, then up to Skyline and back down to Saratoga via Route 9. It didn't work out that way, but it did indeed start with me driving to Saratoga to cut 20 miles off the edges of the ride. I was riding my mountain bike because I knew Montebello turned to dirt, but I wasn't sure whether it was suitable for the road bike. I rode up Route 9 to Pierce, which peaks at the entrance to the Mountain Winery at about 850 feet. It then drops down to meet Mt. Eden Road, which then climbs up back up to about the same elevation at its peak, crossing over what I presume is Mt. Eden. The road then drops gently along the Stevens Creek Reservoir where it eventually meets up with bottom of Montebello Road. The first part of Montebello Road, running alongside a quarry, is quite steep and offers precious little shade. 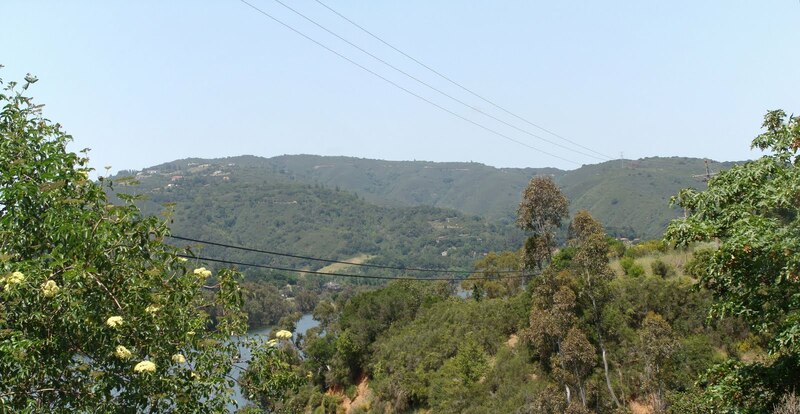 It climbs up the eastern flank of the hill, occasionally giving glimpses off into Sunnyvale and Mountain View, but most memorably offering views of the enormity of the quarries at the end of Stevens Creek Road. The picture below shows the valley, but on the left side you can see a huge quarry -- and it's one of the smaller ones. On the far right of the picture you can just make out the edge of Stevens Creek Reservoir. The road eventually turns toward the northwest, its primary direction. You start seeing vineyards here, and the road becomes a single lane. The tree cover becomes a little heavier. On a hot bright day like this, the difference between an exposed section of road and one that's in shade is palpable. I'd be surprised if it wasn't 20 or 30 degrees. I started the ride with three bottles of water, and I had already emptied two of them. I was at 1800 feet, with another 1000 feet of climbing ahead of me. Lower down I had passed by running water, and I realized that the streams were likely to be increasingly feeble the higher I climbed. As I took this picture there was a little stream next to me. On the maps it's called Swiss Creek, which is a grand name for something with the flow of a garden hose. But it's water nonetheless, and apparently clear, so I filled two water bottles. The road climbs steeply out of the Swiss Creek valley to about 2200 feet, where it reaches the Ridge Vineyards. Ridge Vineyards is well regarded and was recently featured on James May's Road Trip, a show in which a British odd couple travel around talking about wine. In the clip below you can see them driving an RV up to the vineyard, and if you look closely you can see a guy on a bike rounding the corner behind them. That moment, quite specifically, is what made me want to ride this particular road today. As you pass by the winery, you're on the ridge. On the left, the southern slope is all vineyard. On the right is woodland, Silicon Valley, and the bay. As I was taking one my frequent rests in the shade up here, I noticed a small aluminum plaque near the side of the road. It is apparently in memory of Eric Linthorst, who died in 2005. At my own age, I can't help noticing. I don't know anything about it beyond what's written here. By this time in the ride it was mid-afternoon, the heat of the day, and up here this is precious little shade. A half mile after the winery, Montebello has gradually climbed to about 2600 feet, and ends. It becomes a fire road at this point, climbing a barren ridge covered with brown grass to Black Mountain, an antenna farm at 2800 feet. This is the high point of this ride, and the low point of my energy. As I took this picture, the little hill ahead of me seemed insurmountable. After Black Mountain, the trail heads down to meet Page Mill Road at about 2150 feet. According to the original plan I would have turned left toward Skyline, but at this point every small rise in the road looked a mountain to me, and my legs were just empty. So I turned right, headed down Page Mill Road, and called for a rescue ride. I suppose the last section of this ride was this morning, when I took my road bike to Saratoga to pick up my car. That short ride was uneventful but reminded me that I wouldn't have had anything like the energy to get as far as I did, had I started from home. The Garmin reports just 22 miles, with 3100 feet of climbing. I think that's about fair this time. My average speed: walking. Yipes. I'll have to try it again when the weather has returned to its customary pleasantness.